USB 2.0 opens up a whole new realm of possibilities for connecting high-speed devices. Attach an external USB 2.0 hard drive and achieve transfer rates of up to 20MB/sec; burn a full CD in less than 3 minutes by utilizing a 52x USB 2.0 CD-RW; or stream large video files to an external DVD burner. By upgrading your USB interface, utilizing high performance LaCie USB 2.0 devices has never been easier. 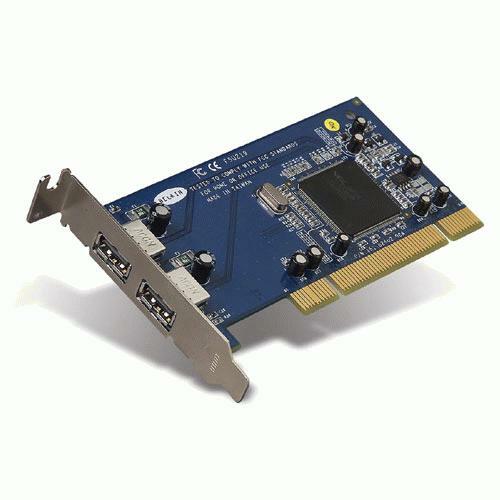 The LaCie USB 2.0 PCI Card allows users with Microsoft Windows 98 SE, Windows Me, 2000 and XP to take full advantage of the new enhanced speeds that USB 2.0 offers with a simple connection. With four external ports and one internal, the LaCie USB 2.0 PCI Card gives you the flexibility to attach up to 127 different peripherals and the ability to add or remove devices without shutting down the computer. The card automatically recognizes and optimizes the bandwidth for the devices connected, running at either Hi-speed USB 2.0 (480Mb/s), full-speed USB 1.1 (12Mb/s) or low-speed (1.5Mb/s).